When I was thinking of festive flavors that would also work well with the turkey I immediately landed on mulled wine. I mean, is there a more festive drink? It straight up tastes like Christmas in a cup, and besides maybe eggnog, I really don’t think there is a drink that signifies the season more. Because I typically cook my turkey with some sort of wine glaze anyways, I knew incorporating the flavors of mulled wine would work perfectly. As for the incorporation of the chestnuts, that was another no brainer. Or, at least for this Italian girl, it was. Chestnuts have always been big in our family, especially around the holidays, and, if you’ve been to Italy around this time of year, then you know you can find vendors roasting and selling them from small carts on many of the street corners. I’d be lying if I didn’t say I was also slightly inspired by “…chestnuts roasting on the fire”. Either way, I knew this was just the distinct Christmas flavor the turkey needed. I decided to use them in the form of a simple chestnut stuffing cooked on the side (I don’t actually like stuffing my turkey both because it adds cooking time to the turkey but also for food safety concerns.). For the actual turkey, we used our go-to, Shady Brook Farms. 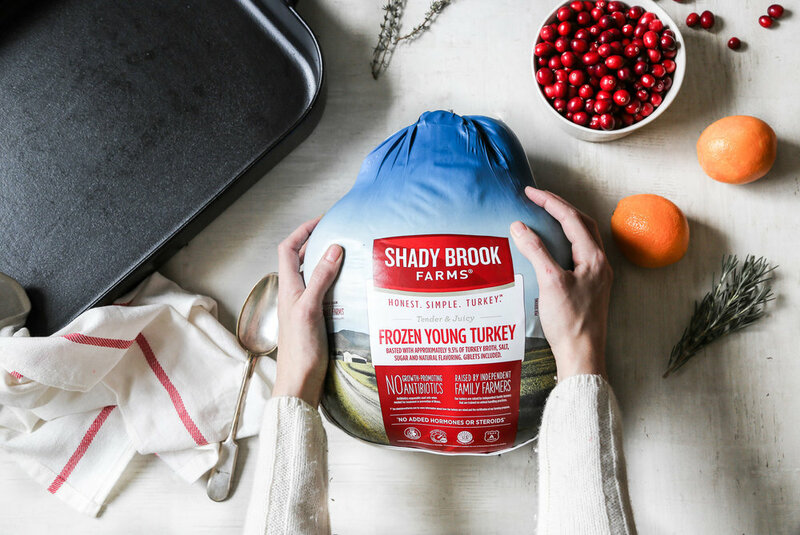 I pretty much can’t remember a time we haven’t used Shady Brook Farms turkeys, or any of their other turkey products, for that matter. My Mom has cooked with it for years and, I’ll never forget, when Mr. RC and I first started cooking together how I convinced him that we absolutely had to use Shady Brook Farms. I insisted on getting their meat as I knew it was the best. He didn’t understand why we couldn’t just get “the cheap stuff” but after I pointed out things like their meat had no growth-promoting antibiotics in it or that their turkeys are raised on family farms by farmers taught proper handling practices, he started to change his mind. When he realized their meat was actually reasonably priced (and comparable to other meat he was buying), he came around even more. But it was once I actually cooked him a meal using the turkey meat, that he was completely sold. The flavor was so fresh and hard to beat. Needless to say, he never argued with me about what kind of turkey to get ever again! Because I am so familiar with these turkey products and have used them regularly for years, I couldn’t be more thrilled for what I am about to tell you next. Eek! Are you guys ready for this?!? I am partnering with Shady Brook Farms (if you live on the west coast look for their turkey products under the name Honeysuckle White) over the next several months to share all kinds of delicious turkey recipes with you! So exciting, right?! Get ready to do lots of gobble, gobbling! What do you guys typically have for your Christmas/holiday dinner? I’d love to know! Preheat oven to 450 degrees. Prepare your turkey according to the package directions, locating the neck and giblets inside the cavity and setting them aside (They make delicious gravy! ), giving the turkey a rinse and patting it dry. Then, place the turkey in a roasting pan. In a small saucepan set over high heat, bring the wine, spices and orange juice to a boil. Continue boiling, stirring occasionally, until the mixture has reduced to about half. Remove from the heat. Meanwhile, combine the orange zest with the melted butter. 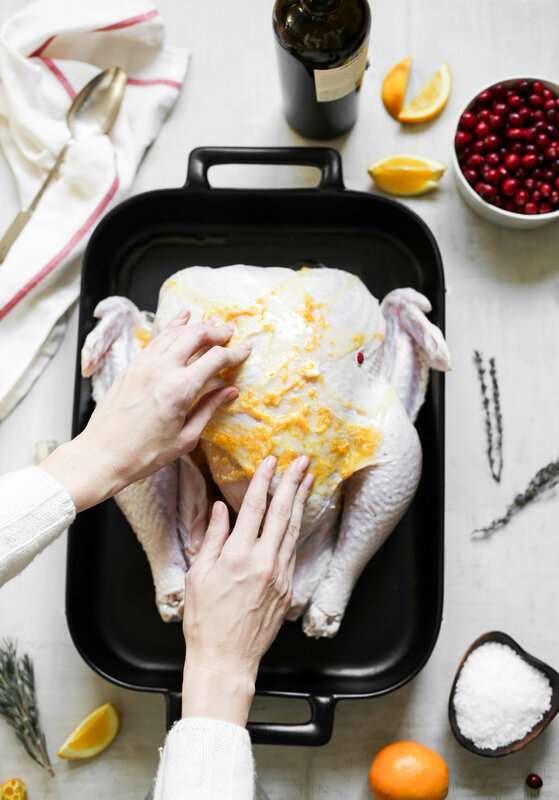 Pour it over the turkey and use your hands to gently massage it into the skin. Sprinkle generously with salt. Then pour the wine mixture on top. Bake for 30 minutes at 450 then turn the oven down to 350 degrees. Continue cooking, making sure to baste the turkey with the wine and drippings in the bottom of the pan every 30-45 minutes. Your turkey is done when it reaches an internal temperature of 165 degrees. For our 15 pound turkey it took about 4 hours, but times vary depending on type of pan, oven, etc. Once cooked, remove from the oven and let it set for 30 minutes before carving and serving, being sure to reserve the juices for gravy and the chestnut stuffing.